Just when we had finally seen the last commercial prominently involving gas pumps, now second-rate marketers everywhere have a new crisis to exploit. Words like "stimulus" and "bailout" have become national buzz words in light of the recent economic situation, and are quickly making their way into all manner of advertising, no matter how tacky. 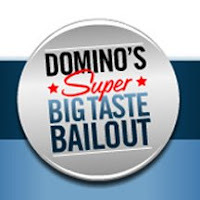 Some recent examples I have seen include a "Big Taste Bailout" from Domino's Pizza, and a "Taco Cheeseburger Stimulus Package" from Taco Time. Keep up the good work, fellas. We have been watching Lost faithfully since its second season, and every year there are a slew of new shows that ABC promotes into the ground. We are talking the same ads every commercial break of every new episode. In previous years it has been Invasion, The Nine, What About Brian?, October Road, Day Break, and Eli Stone, among others. This season it's Better Off Ted, Castle, Life On Mars, and The Unusuals. Even after seeing approximately 847 hours of promos, I think I have watched a grand total of 8 seconds of all these shows combined, most of which only aired a handful of episodes before getting the axe. Maybe a DVR really is worth the extra $10/month. Like most, when I first joined Facebook, it was exciting to reconnect with dozens of people I hadn't talked to in years. But after a quick exchange recapping what we had been up to since whenever, I soon remembered why we lost touch in the first place. I still think that Facebook is a great networking tool, but man is it a time waster. Whether it is sifting through the banal status updates ("So-and-so loves the nice weather!!! "), taking silly quizzes ("What Disneyland ride are you? "), or fielding invitations to all sorts of pointless groups, there is no limit to the triviality. 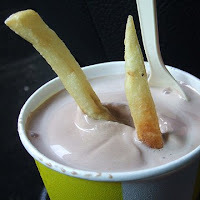 I recently noticed a friend of mine has become a fan of "Dipping Fries in a Frosty," which upon further inspection, currently has 95,965 members and counting. Seriously. Anyway, I need to hurry up and get this posted so I can check my news feed again. Wait, what do you like? Perhaps if there was a little thumb pointing to the "this" in question, your comment would be less confusing. I think those face book questionaries are extremly acurate. I should quit wasting time writing on your blog and go find out which country I am most like.